Thank you for your unanimous support for the motion brought forth in August 2018 by Councillors Hawkins, Stevens, and Bresciani, to Protect Wascana Park from Commercial Development. We are very happy and greatly relieved that Wascana Pool will retain its present and most perfect location in Wascana Park. We would like to thank you for having the courage to defend the Wascana Park Act from commercial business in Wascana Park, and for understanding the historic recreational purpose of Wascana Pool in Wascana Park, close to the city centre. neighbourhood so well. We also hope that the popular Seniors’ morning aquacize class, attended regularly by many, until it was cut last year, will be reinstated. We also want to express our gratitude for your unanimous support for the motion to Make Regina a 100% Renewable City, brought forth by Councillors Stevens, Murray and Findura! It makes great economic sense for a renewed Wascana Pool to embrace the best of green sustainable technology. These recent positive civic decisions give us hope, and tie directly into our five ideas that Friends of Wascana Pool, formed in 1994 when Wascana Pool was threatened with closure, proposed for the Design Regina Citizens’ Circle (Appendix 2) in 2012, outlined below. A renewed Wascana Pool should be a Swimming Pool. We advocate that Wascana pool be a swimming pool(as opposed to a leisure pool), offering an accessible swim experience for ages 1-100 years. We would recommend that Wascana Pool focus on swimming as an activity in and of itself. A competitive size 50-metre swimming pool, making the pool a viable venue for competitive team swim meets, as well as for athletic training and recreational swimming, in the most beautiful part of the city. This swimming pool should be heated to a cooler water temperature that permits swim training and racing to be done without the risk of swimmers over-heating. A second warmer pool with beach entry for children, for aquasize, and for seniors and others who suffer from arthritis, or simply cannot manage cool water. A toddler pool, with a clear safety fence, would complete the inclusive swim package. The illustrated paddling pool, near Wascana Pool, is now a sand pit. perhaps, a longer open season and an earlier opening time( 8 am does not allow those who work to swim in the morning). this be a possible partnership to explore, considering the gift of the civic land to the Conexus College Avenue complex? We suggest an alternative ecological water treatment system, instead of the present chlorine, such as ozone with ultraviolet, newly installed at Sherwood Park Millennium Place Recreation Centre, or a salt water system just renewed at Kits Pool in Vancouver. A natural 1 botanical filtration system opened at Borden Park Pool in Edmonton this year, and a temporary pond was tested near Kings Cross, in London, England. Such technological updates would make this renewed Wascana Pool a wonderful example of green technology for swimming pools around the country. The heritage of Wascana Park should be respected. Wascana Lake was created for leisure, sports and recreation, and, when Wascana Lake was found to be dangerous for swimming in 1947, Wascana Pool was built. own history, if rebuilt in the spirit of the Portnall original, updated with the best of green technology. perfect, that even on cooler windy days, the pool deck is a micro-climate of warmth and pleasure. The recently-begun commercialization of Wascana Park is a massive threat. It threatens to destroy our cultural, recreational, and architectural heritage -as well as green space – in Wascana Park. Gone already is the mid-century modernist white cube of the first MacKenzie Art Gallery (1953), designed by local architect Francis Portnall (long before we called an art gallery a ‘white cube), and its the Massey Award nominee artist studio, with northern light, built for the Regina 5 by Arnott Izumi and Sugiyama. Next, Portnall’s handsome yet unobtrusive two-toned brick CNIB building, designed in 1956 especially for the blind, is currently being destroyed (without a demolition permit!) for the new Brandt building. 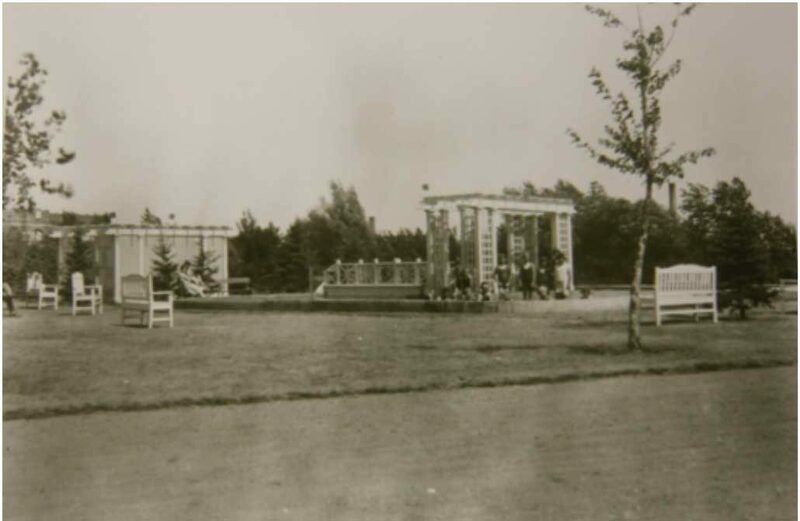 With the loss of the Wascana Pool building (1948), all three Portnall buildings within Wascana Park will be destroyed – without any public discussion or recognition by City Council of their historic merit and architectural worth. Indeed, we are nothing short of alarmed that we need to bring to the attention of decision makers the unique and valuable heritage of these buildings. According to Norman Henderson, adjunct professor of Johnson-Shoyama Graduate School of Public Policy, the designation of pools as heritage or historic sites is perfectly normal, In Regina, the RCMP depot gymnasium and pool building is a designated Federal Heritage Building. Wascana Pool easily matches the heritage value and community importance of the RCMP pool. In our Friends of Wascana Pool Citizens Circle for Design Regina (2012, Appendix B), we mention two restored Heritage pools, Queen Elizabeth Pool in Edmonton, and the London Fields Lido, London (Hackney), UK. Our Wascana Pool is, without question, comparable to these other heritage pools with respect to architectural, local history, and community value. most certainly help to lower provincial health care costs. Yet ironically, civic tax dollars often go disproportionately to spectator sports venues – which do little to keep us active and healthy. Happiness and well-being are hard to quantify, economically, but if we are happy and healthy, we are less likely to put a strain on the healthcare system. Another benefit is that we are less likely to move away from Regina. Wascana Park amongst the trees, and to be living in Regina in summer. At Wascana Pool, we form community. recreational swimmers of all ages from across the city, as well as water polo, synchronized swimming, and diving clubs. It is a delightful unstructured play-space for children as well. We worry that that this new concept of a “destination fun park” does not recognize or place importance on swimming as a life skill that serves us our whole life long. It is a skill that can save lives! As an all-body activity, swimming will help us age well and reduce health issues, thus lowering societal health care costs. Water slides for a “destination pool” seem to move in another direction, with inevitably more trees destroyed, more noise, more concrete for parking lots, and most likely less time and/or space for simple lane swimming. Being a destination pool, many swimmers from the Y come to Wascana Pool in summer, and others only swim outdoors. Because of this, many Friends of Wascana Pool swimmers did not see a sign at the Lawson which announce the invitation to participate in a Recreation Survey. the fact that water slides already exist in some hotels in Regina. Thus, we, Friends of Wascana Pool, would like to strongly suggest that you distance yourselves from a “destination pool”: a regular swimming pool is so valuable to so many, and so needed. If we do want to save money, simplicity of concept to offer a quality experience of swimming outdoors in the sun (or rain! ), in summer in a Prairie City with a harsh winter, far from the ocean, in beautiful Wascana Park would be to (re)create a swimming utopia for our citizens. Must a renewed Wascana Pool lose a full summer swim season? Could work be done in Autumn and again in Spring? We know that construction methods have improved since 1947, when the lake was found to be dangerous for swimming, Wascana Pool opened in 1948. We do not want to be forced to move away for a summer, our best season. Thank you for taking a strong stand on the importance of civic recreational structures such as swimming pools, curling rinks, and great public parks and spaces to our collective health and future. Wascana Pool is crucial to the health and well-being of so many people. A renewed 50-metre Wascana Pool would be a commitment to our long-term health and happiness. We await public consultations, and would be most happy to help to create a renewed Wascana Swimming Pool for the 21st Century. Please keep us informed and involved. PS: Some swimmers of Friends of Wascana Pool have expertise in ecology and economics, swimming pools and landscape design. Many of us have swum in outdoor pools across the country and abroad, and we offer a few examples in Appendix A.